At GreenMax AgroTech, we have special expertise in large scale mass production of Trichoderma viridi. We are capable to produce about 10 tonnes of high quality (minimum 107 CFU per gram) Trichoderma viridi technical grade formulation per day. Mother culture of Trichoderma viridi was sourced from Tamil Nadu Agricultural University (TNAU), Coimbatore. Trichoderma viridi, mass multiplied from virulent and pure mother culture is supplied as talc based formulation. The product will have a minimum population of 1x 107 (CFUs)/g. Talc carrier based product. The product has a minimum shelf life of one year from the date of manufacture. Trichoderma spp. are fungi that are present in nearly all soils and other diverse habitats. Trichoderma are known for their production of several lytic enzymes and , among them T. viride and T. harzianum are commercialized. Strains of those species are widely used in biocontrol of soilborne plant-pathogenic fungi occurring in the most extreme to the most mundane of habitats. Trichoderma fungus is well known for disease and nematode control of crop plants. •Trichoderma controls diseases by the production of several lytic enzymes and controlling disease causing microbes. •Trichoderma controls nematode infestation by feeding on infective nematodes. •These fungi compete with other disease causing microbes for nutrients and space. •These fungi increase the rate of plant growth and development, by developing more robust roots. These deep roots cause crops, such as corn, and ornamental plants, to become more resistant to drought. •Trichoderma also solubilizes phosphates and micronutrients. •Trichoderma harzianum produces enzymes such as protease which controls Botrytis cinerea. •Trichoderma are also helpful in solubilization and sequestration of inorganic nutrients. 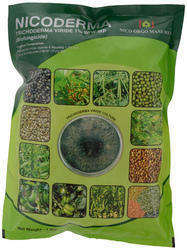 For one kg of seeds about 40 grams of Trichoderma product is required. Mix required quantity of Trichoderma with equal quantity of Rice gruel .With this mixture, mix the required amount of seeds shade dry and after 24 hours, use the seeds of sowing. Mix 2 Kg of Trichoderma with 50 lits of water. In this mixture, keep the seedling roots in immersed condition for 10 minutes and use the seedlings for transplantation in the field. Mix about 5 kgs Trichoderma with 100 kgs of organic manure, keep the mixture under shade for one week and apply to the soil. Trichoderma viridi along with Pseudomonas fluorescens is recommended for all crops in all the seasons for disease control and plant growth promotion. Looking for Trichoderma Viride ?